A Catalan election this month, which the pro-independence movement has billed as a proxy on independence, is due to indifference to Catalan demands shown by Madrid, the head of the regional government said on Wednesday (2 September). Spain’s Prime Minister Mariano Rajoy earlier this week rejected that the vote could be a proxy on independence. The Catalan ballot comes before a general election due by year’s end which Rajoy’s centre-right People’s Party is expected to win. His government banned a non-binding Catalan vote on independence last November, although a vote took place anyway. “We are using the election as a last resort because the different paths that different parties have tried have ended up smashing against a granite wall of incomprehension,” Artur Mas told an extraordinary parliamentary committee. The pro-independence platform he heads has said everything is ready for a unilateral declaration of independence in around a year’s time if the regional vote gives them “a clear mandate”, as they expect. Opinion polls show pro-secessionists are likely to win this month’s vote but may be short of a majority. 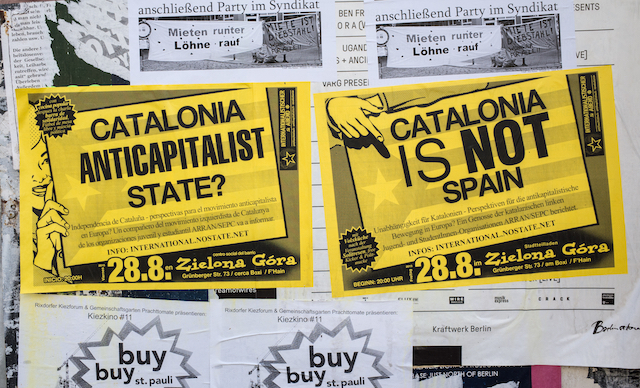 Polls also show that around 80 percent of Catalans, regardless of political affiliation, favour holding a referendum on the region’s status, with or without Spain. Madrid has ruled out a referendum. On Tuesday, the government announced it propose increasing the powers of the Constitutional Court to ensure its rulings are met, something political parties said was aimed directly at Catalonia. The European Commission has warned Catalonia that it would no longer be considered an EU member state if it became independent from Spain. Answering to pressing demands from the Catalan government and the Spanish press, a top EU official said that any new independent state would become "a third country". The Commission reiterated its comments after a group of advisers to the Catalan government published a report saying that an independent Catalonia would be able to stay in the EU.